The Rollback Management tool allows you to control the rollback data and provides the same management parameters as the existing rollback_management.php command-line script. The Rollback Management tool is shown in the figure below. Rollback Status: select whether or not to enable rollback for the system. By default, it is Disabled. 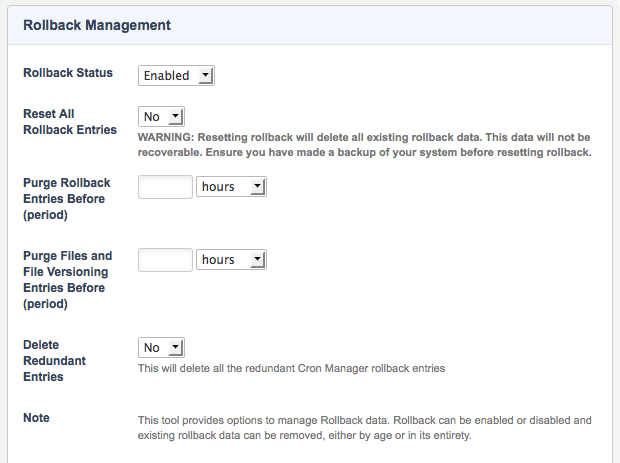 Effective Date of Rollback Entries when Enabling or Disabling Rollback: enter the date to set the rollback entries to. Reset All Rollback Entries: select whether or not to reset all rollback entries. If you set this to yes, all existing rollback data will be deleted. Purge Rollback Entries Before (period): enter how old a rollback entry must be in order for it to be purged. For example, if you want to purge all entries that are two months old, enter 2 months into this field. Purge Files and File Versioning Entries Before (period): enter how old a version file must be in order for it to be purged. For example, if you want to purge all files that are two months old, enter 2 months into this field.